High Surge Current Signal Line Protectors SLD Signal Line Protectors are designed to protect the most sensitive electronic equipment in lightning intense environments. 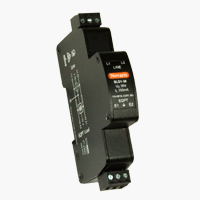 So they are ideal for the protection of PLC’s, fire and security systems, railway signalling and SCADA equipment. Multistage Transient Protection : These devices feature multistage transient protection deliver greater levels of protection through a staged approach. The primary stage absorbs the majority of the surge energy. The remaining stages provide accurate clamping and a degree of redundancy. Fusing: Surge current fuses allow components to absorb maximum energy,but in the event of a component failure, the fuse will open to isolate the damaged component. Novaris surge protection products are housed in safe, all metal enclosures. In the event of a prolonged overvoltage they will not catch fire or explode.